This program updates the DSLR-A330 camera firmware to Version 1.10. IMPORTANT: This firmware update is only for a DSLR-A330 camera that has Ver.1.00 of the firmware installed. Only DSLR-A330 cameras that meet the criteria for the current firmware version should proceed with this firmware update. Follow these steps to check your firmware version. Double-click the downloaded file (DSCA330V110.exe) to decompress it. Prepare the recording medium (Memory Stick PRO Duo / Memory Stick PRO-HG Duo / SD Memory Card / SDHC Memory Card) to use for the update. Format the recording medium on the camera. Turn OFF the camera power, then insert the prepared recording medium into the camera. Ensure that the memory card switch is on the side of the inserted media. Press the MENU button to display the menu, select Playback menu-1 using the Control button. Select Format in Playback menu-1 with the Control button then press the Center button of the Control button. Copy the update file (DSCA330.APP) to the formatted recording medium (Memory Stick Pro Duo / SD Memory Card) with one of the procedures below depending on your environment. Copy the update files DSCA330.APP to the root folder of the recording medium. Connect the camera to the computer with the USB cable, and copy the update file onto the recording medium. Before copying the file, check the USB connection. Insert a formatted recording medium in the camera.- If the recording medium has not been formatted, please format the medium. - Select the type of memory card you want to use using the memory card switch. Slide the camera POWER switch to the ON position. Press the MENU button and display 3 of the Setup Menu, using the control button. - Check that “USB connection” is set to “Mass Storage”. Select the decompressed update file (DSCA330.APP) and copy the file from the computer onto the root folder of the recording medium within the camera. When the copying the file is complete, disconnect the USB cable. When performing the firmware update, use fully charged rechargeable battery pack NP-FH50 or the AC adapter AC-PW10AM (sold separately). Press the MENU button, and turn ON the power while still pressing the MENU button. When the following confirmation window appears, use the control button to select OK, then press the center of the control button to confirm the selection. Note: If the confirmation window does not appear on the LCD monitor, it may be due to the following. * If it is not formatted, the firmware update may not start. 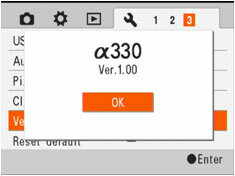 * Please make sure that the update file (DSCA330.APP) is in the root folder of the recording medium. The updating procedure will start, and the following screen will be displayed. Do not turn off the camera until the updating procedure is complete. When the firmware update is complete, the following screen will be displayed. As the camera will automatically restart after approx. 10 secs, please wait for the camera to restart. After the camera has restarted, turn OFF the camera, and remove the recording medium. Next, check that the camera firmware version has been correctly updated. Check the firmware version by following the instructions below. If the firmware version is Ver.1.10 the update has been performed correctly. Turn ON the camera power. Confirm that the version is Ver.1.10. Press the center of the control button to close the version display. After updating the camera, format the recording medium or delete the update file DSCA330.APP from the recording medium.